So Rosti season has finally arrived and we have had some cold nights. Who, other than Dan Qualye, doesn’t like potatoes? This is a grand tradition in our house that is loosely based on our old restaurant’s version and based on dish that was made at the hotel I worked at in St. Anton Austria as a ski bum a few years back. 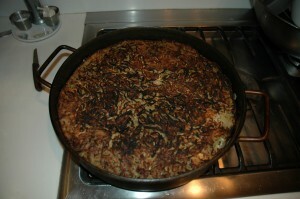 This is without a doubt Sasha’s favorite dish and universally loved by all. It can cause some serious damage in the feeling full department, but all our meals seem to do that. Don’t be fooled by the vegan gluten free thing. We can eat too much and feel really full with our diet. I personally can gain some serious weight without eating Big Macs. I have tweaked this dish a little in the last few years and sort of developed a slow cook method that doesn’t require constant attention. All you really need are potatoes, onions, salt and pepper. 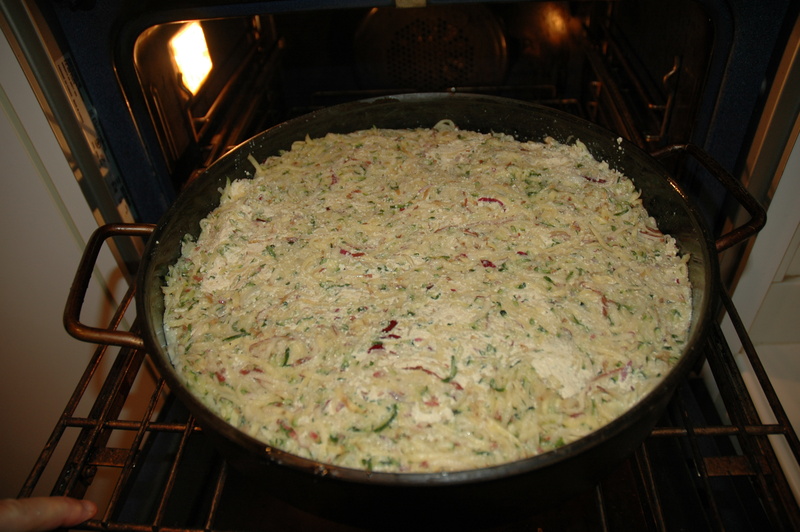 We have added Zucchini to the dish and now it makes up about three fourths of the ingredients. 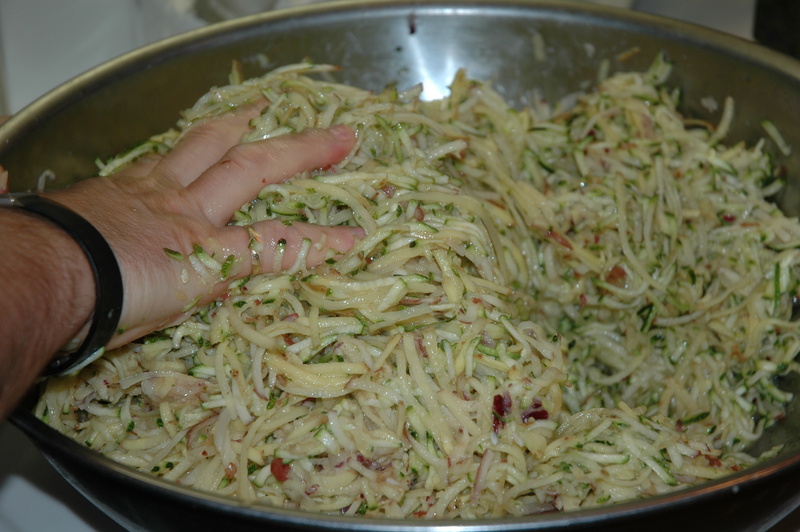 Not that potatoes are bad for you, but I know it helps to eat more zucchini proportionally. This dish can be served solo or as a side. It is insanely substantial and the leftovers are the best part. Like most things we cook, we make a ton so we can have lunch and leftovers. You need some method of shredding. I use a Cuisinart, but have used a hand grater or mandolin when a machine isn’t available. This last time I used about eight mega zucchinis, 10 potatoes, and two or three onions from Twin Springs. When checking out Maura asked what I did with the zucchinis and I am posting this for her as well. 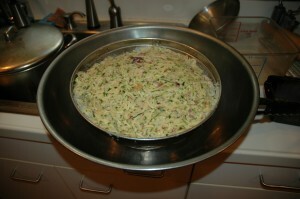 I grated all items with the medium blade and put into a large metal bowl. I did this before I picked the kids up from school at about 2:00. In the bowl I added literally a fist full of salt. 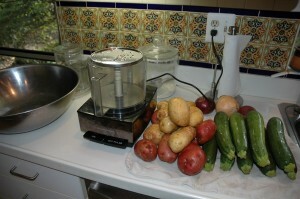 The reason is for the mega salting is to extract the water from the veggies and help with the cooking. I mix all the contents well and drain as much water by hand as possible. 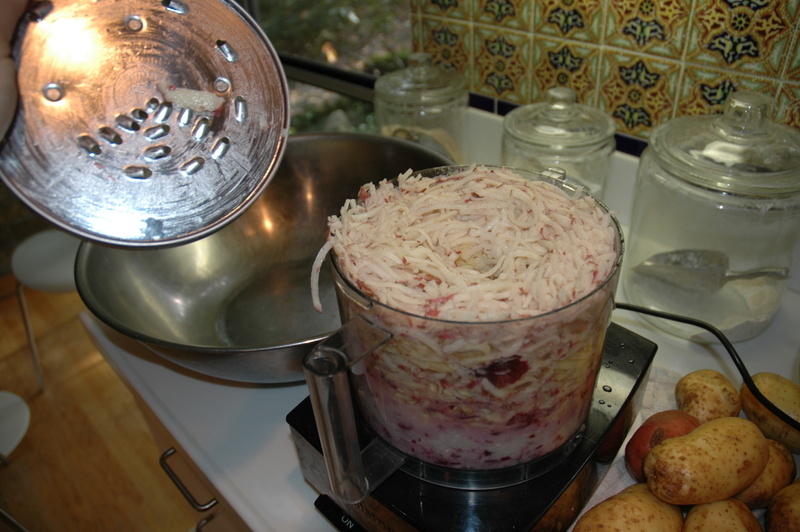 I then put everything into a fine colander with a bowl underneath. This goes in the fridge and every time I walk by for the next few hours I dump the extracted water. There isn’t a science here. When you go by, you go by and do it. No special trip needed. Like most of these dishes, I try to make them as bomb proof as possible to allow for crazy schedules and multiple distractions. I then put the contents into the same large mixing bowl I used to mix in the salt and catch the extracted water. Virginia says I use every pot in the house when I cook, but I really try and reuse as few vessels as possible. I then add pepper and sometimes I crush up a brick of tofu to mix in and give a little protein fortification. I do this if we haven’t had much soy in the past few days or if I am not going to have a protein source in the sauce. Tofu sour cream is the way we usually serve it, but Noah and I prefer to have a tomato or bean type sauce along with the house made hot sauce that goes on everything. Cooking time can be as short as 1.5 hours, but if you have 2-2.5 I think the results are better and that just happens to be the time that soccer spans for both Noah and Sasha three days a week. Once the water is extracted, you oil a pan, casserole or covered dish that is large enough to have the contents not exceed 3 inches in thickness. If you have a shorter cooking time you can cover the dish to help cook everything more quickly. We like the top crispy so we either cook it uncovered or we broil it at the end. If we are on the more than 1 hour schedule I usually put the oven at 350-400. If the dish is on the top rack we get the desired texture on top. In hurry up cooking I will crank it to 450 covered and then broil the top for desired texture. This dish is hard to screw up. You can cook it at any temp for different times and still make it come out great. As you make it a few times you will figure out the best way to make or at least get comfortable with different ways depending on your schedule. 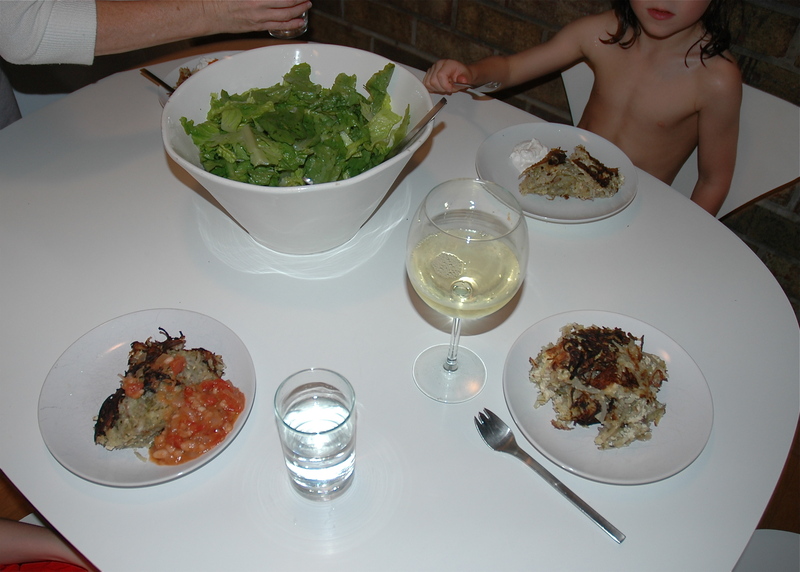 This time we topped it with a white bean tomato sauce and had a Twin Spring green salad. Any wine goes with potatoes, but if is chilly out, we like the reds. 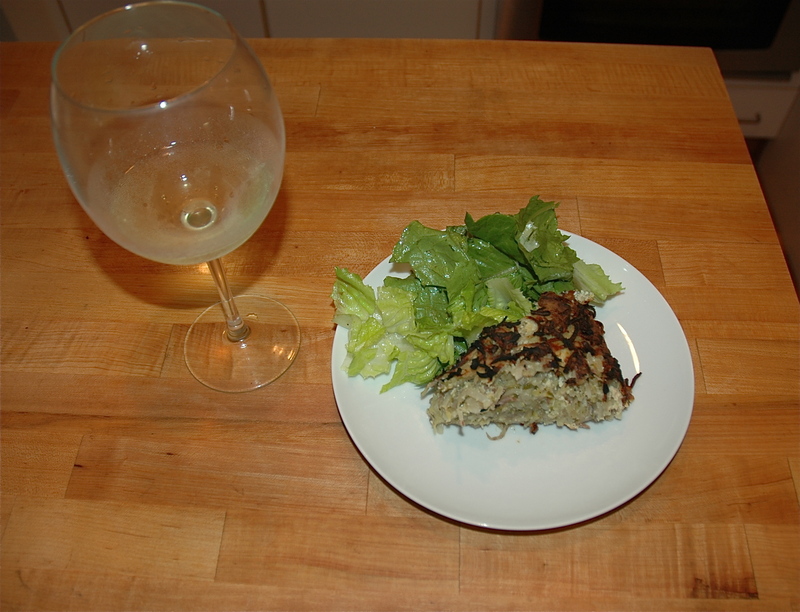 A hot fall still gives us time to enjoy a great white Rioja with this serving. House daddy, this post is over six months old. What are you doing with all your spare time if not wasting it on the internet?